The coffee project is up and running for 2014!The team I am going over to Zimbabwe in February of 2015 with has joined forces with a fantastic organization called Nhaka Foundation. Nhaka is working to reach the orphans and vulnerable children in the rural areas of Zimbabwe Africa. Read More – HERE. The idea for this came to me, unsurprisingly, over a cup of coffee. I am a huge fan of coffee, especially good coffee. It is a required component for my morning and my co-workers know all too well how I function without it (it’s not pretty). I was drinking some coffee from Africa and thought, Zimbabwe is in Africa, Africa has great coffee, I should be drinking coffee from Zimbabwe. I then found a place in the South Carolina called The Leopard Forest Coffee Company that imports green coffee beans from a coffee estate that was founded by the same owners in Zimbabwe in 1960. Leopard Forest then roasts the beans and sells them in the U.S. The estate in Zimbabwe helps support over 90 local families through excellent wages and benefits. Leopard Forest has an incredible story and it truly is an honor to work with such a well run organization. Check out this article that explains a little about them. Teaming up with them was a logical choice and they are willing to provide us coffee direct from Zimbabwe at a discounted rate. Zimbabwe Pinnacle: A Lightish-medium roast with no oil appearing on the beans. A big, bold coffee with classic East African blackberry wine notes and citrus in the finish. Spice in the dry fragrance. The concept is very simple. Support the workers and economy in Zimbabwe by purchasing beans hand picked in Zimbabwe. Then, taking the proceeds from the sale of those beans and using them to help reach orphans in rural school districts in Zimbabwe. This takes the process full circle. Delivery Method: Picked up at Three Cord, delivered to your house (please include address), or any other option. This single estate coffee comes from Crake Valley Estate, in the mountains near the town of Mutare. 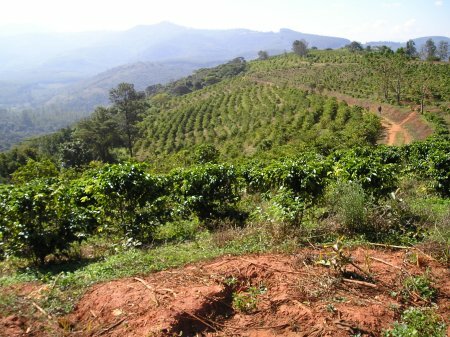 These mountains which separate the steaming plains of Mozambique from the sweeping high veldt of Zimbabwe have the high rainfall, mists and mild climate that make it ideal for coffee growing. The area is characterized in its lower hills by cool indigenous forest, but on the mountaintops by limitless views and waving russet colored grass. The owner Robert Boswell–Brown, is a second generation coffee grower. Since 1960 the family has strived to transform the farm into a place of outstanding beauty by preserving existing forest while planting coffee and pastures. Crake Valley Estate continually strives for ecological balance and, being also a dairy farm, they have been able to intercrop and rotate coffee plantations with pastures to break any build up of pests and diseases, especially focusing on Integrated Pest Management and different indigenous shade trees. Manure from the dairy goes onto the coffee, while the coffee skins, sugars and water from the farm pulpery are spread or pumped onto the pastures. To ensure the coffee is at its peak quality, they handpick their pure Arabica berries and wash them in the sparkling mountain water. The farm supports over 90 families; and many have been there for 30 years or more. Ensuring a high standard of living for the employees is critical to producing high quality coffee. Leopard Forest pay salaries far exceeding government-stipulated wages, and provide all workers housing (with water and electricity), a day care center, primary education, health care, soccer team, and community hall in the farm village. In 2002 Crake Valley were awarded the Innovative Farm Management award from the Zimbabwe Coffee Growers Association. The award is not only for inventive farming techniques, but also farm maintenance, quality of life and working conditions for their employees. I would like (2) Bags. Whole Bean or Ground is fine with me.